Morning Links: Long list of bike events, a moving tale of a cross-country rider, and what the hell is Metro on? We’ve got a long list of bike events to catch up on. Explore the new MyFigueroa Complete Streets project this afternoon with the Bike on Fig Ride, hosted by BikeSafe USC and MyFigueroa. Metro’s Bicycle Education Safety Training (BEST) Program is teaming with People for Mobility Justice and the Ride On! 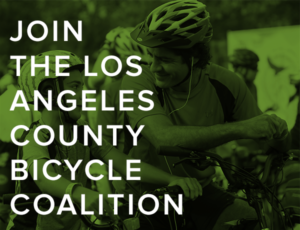 bike co-op to host the People Street Bike Rodeo in Leimert Park starting at 6 pm tonight. Culver City, Go Human and the Southern California Association of Governments (SCAG) are sponsoring Experience Elenda on Elenda Street in Culver City tomorrow. Also tomorrow, BikeSGV and Metro BEST are holding the Sriracha Slow Roll through Duarte and Irwindale to the famed Sriracha factory, riding along a little-known off-road greenway. Party for a good cause tomorrow night at the Pure Cycles HQ in Burbank, benefitting the Pablove Foundation to fight childhood cancer. 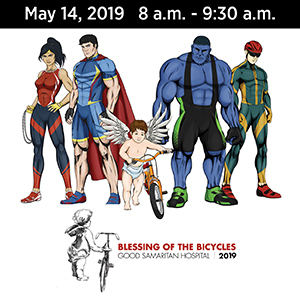 Metro is hosting the Pride of the Valley open streets event in Baldwin Park and Irwindale from 9 am to 2 pm this Sunday. The LACBC and the Metro Best Program are hosting the BEST Ride: Forgotten History of Venice this Sunday. Beverly Hills is hosting the formal dedication and ribbon cutting for the reconstructed Santa Monica Blvd at 1:30 pm this Monday, including the new green bike lanes. Maybe it’s also time to formally retire their designation as the former Biking Black Hole of Beverly Hills. Go Human is sponsoring Connecting Chino on September 22nd to demonstrate temporary street improvements around the Chino Community Building. Go Human and City of San Jacinto are sponsoring Envision San Jacinto on the 29th. Wrapping up our events for this month, CicLAvia celebrates the 100th anniversary of the Los Angeles Philharmonic with the massive Celebrate LA! LA Phil 100 CicLAvia from DTLA to Hollywood. 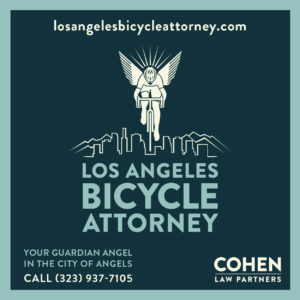 Which will also feature the first ever public appearance of the Militant Angeleno as he leads his first epic CicLAvia Tour. Today The Beauty of Cycling lives up to its name. In a beautifully moving piece from Peter Flax, an Illinois college student describes his ride across the US, just 17 months after he barely survived what could have been a fatal car crash. Seriously, if you can make it through this piece without tears in your eyes, you’re a stronger person than I am. The best way to see California is by bicycle. Warm Showers is like a free, volunteer-run Airbnb for bike tourists. How to plan the ultimate bike trip. Speaking of bike tourism, my brother is nearing the end of the first week of what has so far been a soggy ride through the Pacific Northwest, forwarding these photos from the Washington coast. He also notes that on just the second day of his ride, a total stranger insisted on giving him $20 to buy lunch. Another reminder that there’s real kindness in this world, if we stop arguing long enough to let it surface. Someone needs to find out who is slipping acid into the water coolers in Metro’s marketing department. And mind your manners with your bike, or get banished to a distant planet. Fast Company gets the story half right, saying Los Angeles is making a massive push towards zero emissions transportation, calling for 45% of cars and trucks to be electric within ten years. On the other hand, the city is backing away from its commitment to safer streets for bikes, ebikes, scooters and other forms of personal zero emissions vehicles. LADOT has opened the semi-annual window to apply for speed humps. Which should be installed on every street until LA drivers learn how to take their foot off the gas pedal. Governor Brown has signed an executive order requiring California to be carbon neutral by 2045, a goal the state is unlikely to meet without a dramatic drop in driving. The San Francisco Business Journal says Prop 6, which would reverse California’s new gas tax, is a road back to the past that shouldn’t be taken. I want to be like him when I grow up. A 78-year old retired physician still rides 100 miles a week around his Carlsbad neighborhood. After which he returns his bike to his garage where he keeps his other 21 bicycles — down from the 50 he used to own. Nice story from La Quinta, where police officers and Riverside County sheriff’s deputies pitched in to buy a new bike for a 6th grade girl after hers was stolen. Thanks to Victor Bale for the heads-up. Nearly 100 bike riders opened the new on-road Peninsula Bikeway, providing a connection between Redwood City and Mountain View. Streetsblog says San Francisco may be hosting the Global Climate Action Summit, but the city falls short on bicycling, walking and transit policies. Bay Area bike riders call for change after the arrest of Rich City Rides founder Najari Smith for Biking While Black; black bike riders are six times more likely to be ticketed than white riders in Oakland. The US House has passed the Every Kid Outdoors Act, which would provide every fourth grader with a free pass to enter US public lands by foot or bike, accompanied by up to three adults. Reno warns drivers to watch out for more bikes on the road as Interbike comes to town. This is who we share the roads with. After nearly running a bicyclist off the road, a Washington driver says he was taught that bike riders were supposed to yield to people in cars, and have an obligation to get the hell out of his way. Wired considers what they call the “exquisite, intricate insanity” of Denise Mueller-Korenek’s attempt to set a new two-wheeled human-propelled speed record this weekend at Utah’s Bonneville Salt Flats. A Minneapolis columnist wonders where bikes fit into the city’s updated transportation plan, while a city councilmember looks to the Netherlands for inspiration. 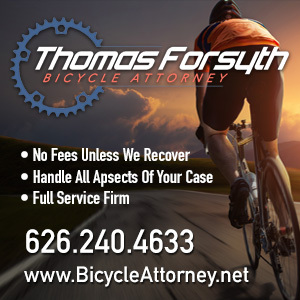 A Philadelphia trash company has settled with the family of a fallen bike rider for $6 million, as well as an agreement to improve driver training and fund local traffic safety organizations. Evidently, they take traffic crime seriously in Louisiana, as a New Orleans driver gets 20 years for the hit-and-run death of a bike rider. The United Nations is struggling to come up with crash avoidance strategies to keep autonomous cars from running over bicyclists. Bike Radar offers a lucky 13 reasons to be a roadie. Toronto bicyclists want to know why nothing has been done to fix death traps on the city’s west side. A British writer tests Brompton’s new folding ebike, with an engine developed by an F1 team, to see if it’s worth the $4,000 price tag. A team from Britain’s University of Liverpool has set new handcycle land speed records for both men and women, topping out at 51.86 and 41.86 mph, respectively. After surviving a brutal hit-and-run, a bike rider says drivers in the UK show little respect for people on bicycles. Kind of like drivers everywhere else. An Irish driver pens a letter to bike riders, insisting he doesn’t want to kill anyone, but if he does, it will be their fault for not wearing hi-viz and putting lights on their bikes. He’s right about the lights, but you shouldn’t have to dress like a clown just to ride a bike. You have an obligation to be seeable, while drivers have an obligation to see you. A town in the Netherlands has opened a new 100-foot long bike path made of recycle plastic. Phillippe Gilbert unexpectedly returns to racing, two months after finishing a stage in the Tour de France with a broken kneecap. Pro surfing is now offering equal prize money for men and women, but pro cycling has a long way to go, despite a few bright spots. Former world track cycling champ Kristina Vogel says she’s ready to start her new life as a paraplegic after she was paralyzed in a training crash earlier this year; she hasn’t heard from the Dutch rider she collided with or the country’s cycling federation. This is what it looks like when 500 cyclists hit the wall. And if Google’s founder had his way, you could have been shot through a 35-mile tube at high speed, propelled from behind by a mixture of helium and oxygen. Um, I don’t think so.